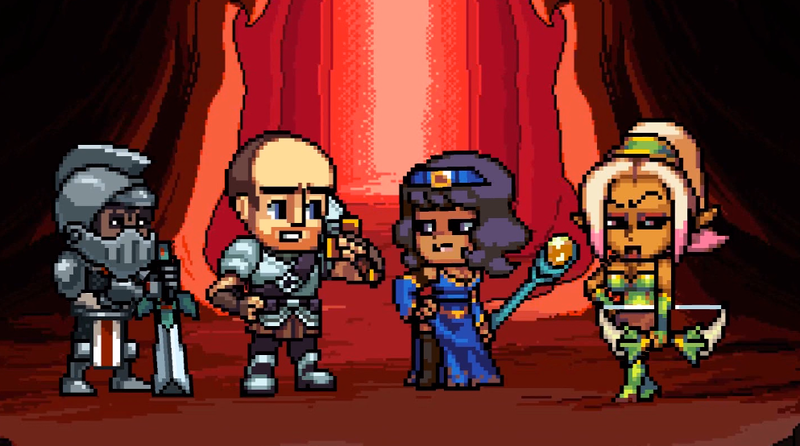 The Webseries Based On Classic JRPGs! 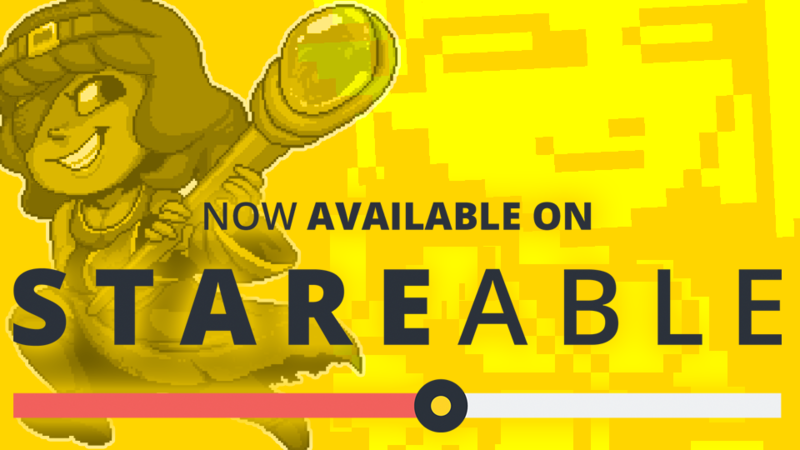 Flagon is Now On Stareable! We’re now listed on Stareable, which means we’re in the company of some amazing webseries! A part of marketing an older webseries involves putting yourself out there, and we here at The Rusty Flagon are doing just that with our new pals over at STAREABLE. If you’ve ever thought to yourself, “Gee, I wish there were a centralized place to find quality webseries,” then Stareable has got you covered. A glimpse behind the pixels to see what an episode looks like in the animatic stage! I made the 1×04 Animatic for Flagon in a bit of a rush. I had fallen behind with the recording and needed to get a locked animatic to my animator before they could move forward with the episode; I had intended to give them as long as possible. What that meant was drawing out each of the thumbnails on notepad paper in a hurry and then scanning them into the computer. Yes, they are very VERY VERY rough. I know that. Somehow StevRayBro and Caitlin were able to turn that into something quite amazing. Kudos to their immense and jealousy-inducing talent! When it comes to producing an animated webseries on no budget, speed simply doesn’t exist. That’s why I’m working on getting some extra behind the scenes content created for our channel. 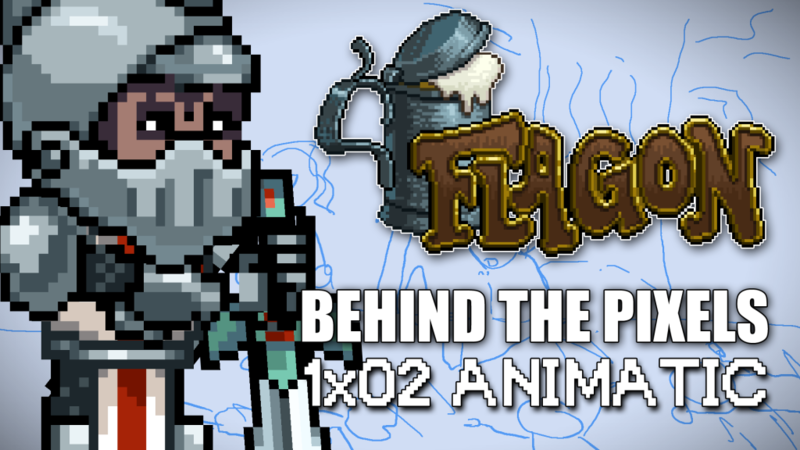 The first of these is our BEHIND THE PIXELS look at the making of Flagon. Right now it’s just animatics of the first season, but over the course of the next few months it will pick up and be more about the production of our upcoming second season. And yes, there will be a more official announcement written up once things are all in place. THE FLAGON SOUNDTRACK ON YOUTUBE! Now you can preview each track before you buy! Part of what makes a series (and a game) so successful is the soundtrack. All the great games on PC, Mac, and Console are enhanced by their equally great scores. Do you remember the first few notes from any Final Fantasy game? Of course you do! The theme to The Secret of Monkey Island? Like time traveling all the way back to 1990. Mega Man 2? Iconic as heck! 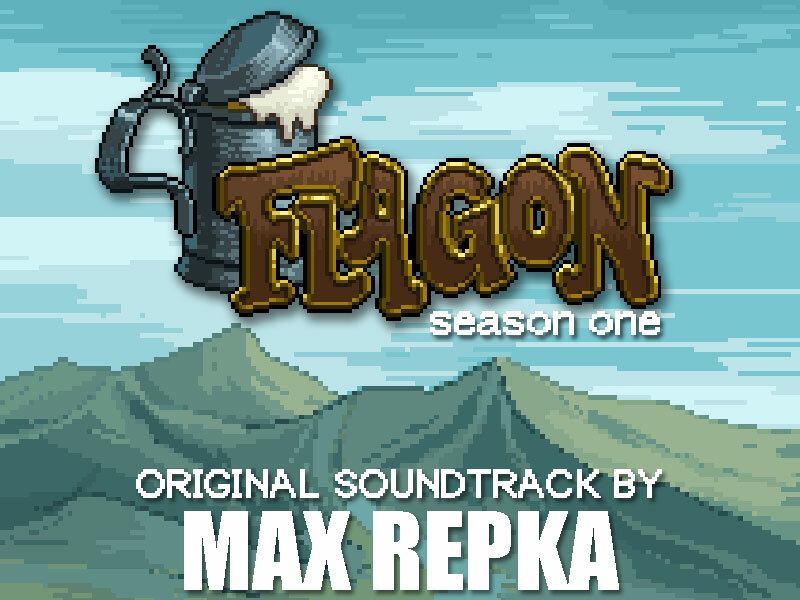 Our goal with Flagon was to give you a soundtrack that not only hit your nostalgia buttons, but that also took you on an epic journey, and thanks to the amazing work of Max Repka, we think we succeeded. And now the Flagon Soundtrack has a home on YouTube! All you have to do is CLICK HERE and you can listen to every single track in all its glory. Yes, even the super secret Game Of The Year Edition version of the FLAGON THEME SONG. If you like what you hear, share it and listen again. Heck, buy you and your friends a copy for the mere price of a coffee! All that love will go directly to Max to offset the costs of producing such an amazing piece of work. Will you be our badass and buy the FLAGON SOUNDTRACK? Here’s the first track from our new album by MAX REPKA! The accompanying video is a clip show of the entire season, so SPOILER ALERT! It’s been far too silent over here at HQ and for that we apologize. Progress on Season Two is coming along quite nicely and we have some great casting announcements coming down the pipeline, but right now we want to draw your attention to the cover art in this post. No, your eyes do not deceive you. We actually have an OFFICIAL (honest to goodness) SOUNDTRACK coming out on May 15! 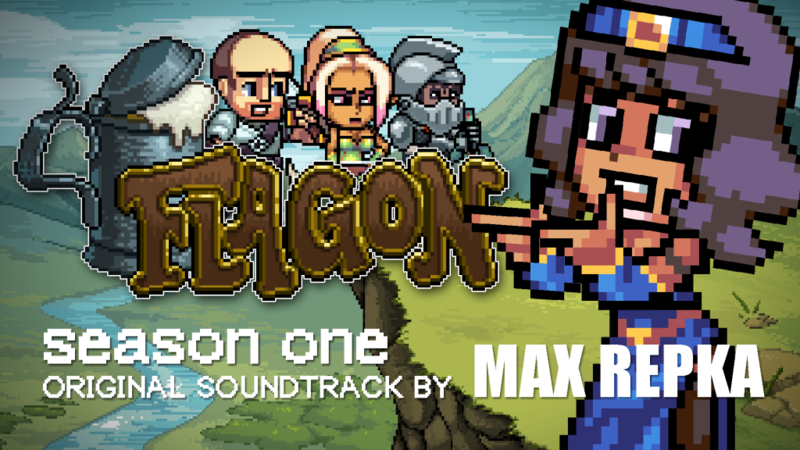 FLAGON: THE OFFICIAL SOUNDTRACK collects music from the first season of our show, with expanded and remastered tracks to take you back to the land of Mjyrn! MAX REPKA worked tirelessly to bring this amazing listening experience your way and starting now you can pre-order the album over on our new Gumroad Store! Price starts at $4 but you can pay more if you’d like. The pre-order gets you all 13 tracks from the album, as well as a few surprises to be announced closer to release. Once the album is released we’ll bump that price up a bit so you’ll want to get in on the action sooner rather than later! The money we make from the soundtrack goes directly to our pal Max to help pay for the hard work he did on our show as well as bribe him to do MORE (harder) work on our show. We’ll be posting the tracks on his YouTube Channel throughout the pre-order window so you can hear for yourself. Be sure to follow us on twitter and facebook to get updates and preview the tracks. It has taken a long time to get to this point but we are proud to announce that the site for our show has gone live. Feel free to look around and see what we’ve done with the place. Check out our CAST PAGE as well as our DEV TEAM page to see the awesome people who have worked on our show. We’ve also got EPISODE SUMMARIES for each season as well as script snippets for you to see what the episode looks like on the page! This section of our site will be the place to get news on all things Flagon. Cast and crew updates? Check. Sneak peeks and reveals? Bingo, friendo! Of course, we need to give a very special shout out to Joey Hoy who helped us with the site backend. Without her assistance we wouldn’t have much of a site! Copyright © 2019 Flagon. Powered by WordPress. Theme: Spacious by ThemeGrill.